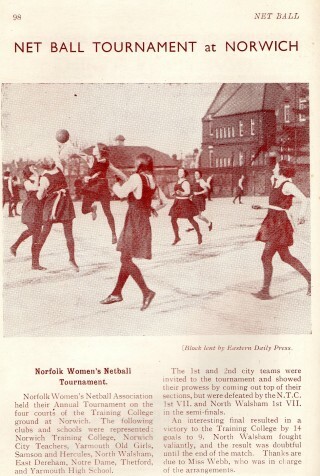 Norfolk Women’s Net Ball Tournament held on the court courts at the Training College ground in Norwich. Participating clubs were Norwich Training College, Norwich City Teachers, Yarmouth Old Girls, Samson and Hercules, North Walsham, East Dereham, Notre Dame, Thetford and Yarmouth High School. The final between the Training College and North Walsham was won by the Training College 14 goals to 9.